Line 9 x 5-inch loaf pan with foil. 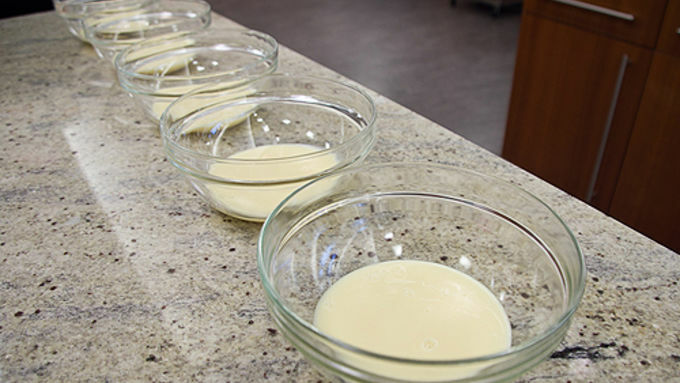 Divide sweetened condensed milk between 5 microwave-safe small bowls, about 1/2 cup per bowl. 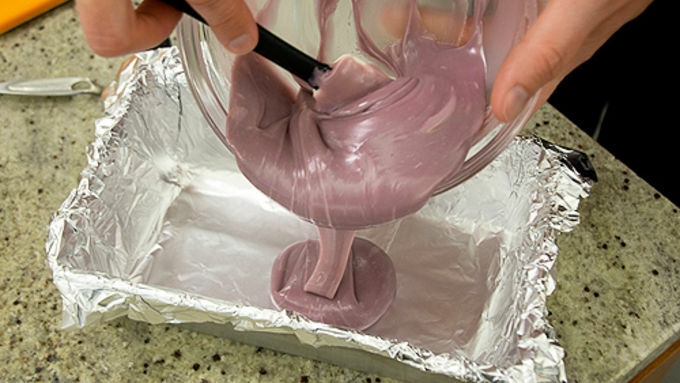 To make the bottom PURPLE layer, add 6 ounces of chopped white chocolate to one bowl of the sweetened condensed milk. Microwave uncovered on High 1 minute; stir until smooth. Stir in 1/4 teaspoon vanilla. Tint PURPLE by adding 9 drops of red food color and 6 drops of blue food color; stir well. Immediately pour fudge mixture in the bottom of a foil lined pan, spreading to edges. Firmly tap pan on counter to even out layer. Place in freezer for at least 15 minutes or until top appears set. For the BLUE layer, add 6 ounces of chopped white chocolate to one bowl of the sweetened condensed milk. Microwave uncovered on High 1 minute; stir until smooth. Stir in 1/4 teaspoon of vanilla. Tint BLUE by adding 18 drops of blue food color; stir well. Gently pour and spread mixture over PURPLE layer in pan. Firmly tap pan on counter to even out layer. Place in freezer at least 15 minutes or until top appears set. For the GREEN layer, add 6 ounces of chopped white chocolate to one bowl of the sweetened condensed milk. Microwave uncovered on High 1 minute; stir until smooth. Stir in 1/4 teaspoon of vanilla. Tint GREEN by adding 18 drops of green food color; stir well. 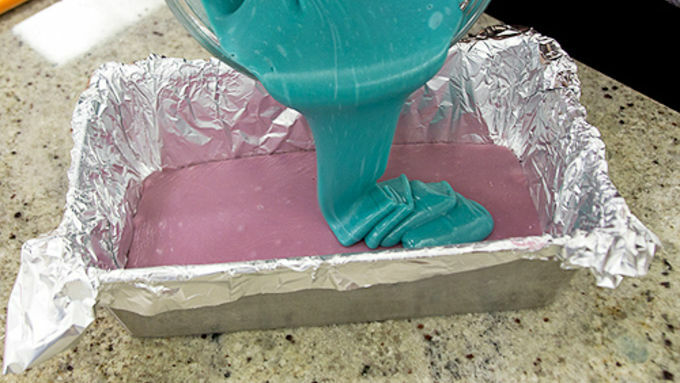 Gently pour and spread mixture over BLUE layer in pan. Firmly tap pan on counter to even out layer. Place in freezer at least 15 minutes or until top appears set. 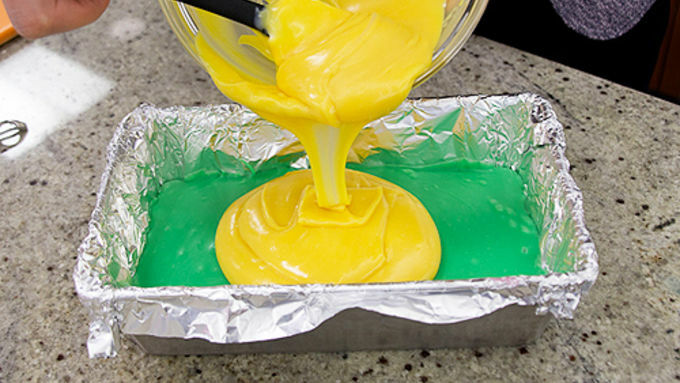 For the YELLOW layer, add 6 ounces of chopped white chocolate to one bowl of the sweetened condensed milk. Microwave uncovered on High 1 minute; stir until smooth. Stir in 1/4 teaspoon of vanilla. Tint YELLOW by adding 12 drops of yellow food color; stir well. 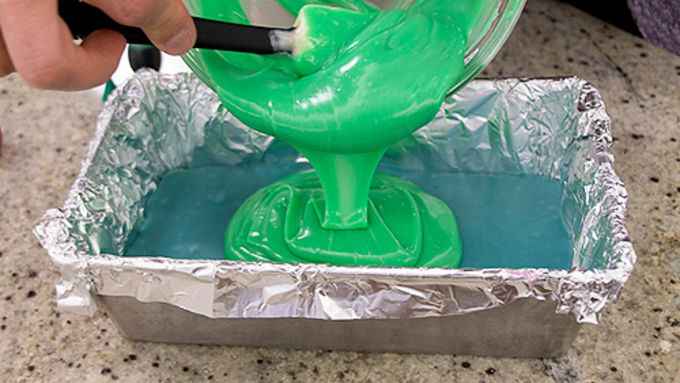 Gently pour and spread mixture over GREEN layer in pan. Firmly tap pan on counter to even out layer. Place in freezer at least 15 minutes or until top appears set. REFRIGERATE at least 12 hours until cold and firm. Cut into 8 rows by 4 rows, trimming edges as desired. If fudge becomes soft during slicing, return to refrigerator to firm up. Store covered in the refrigerator. 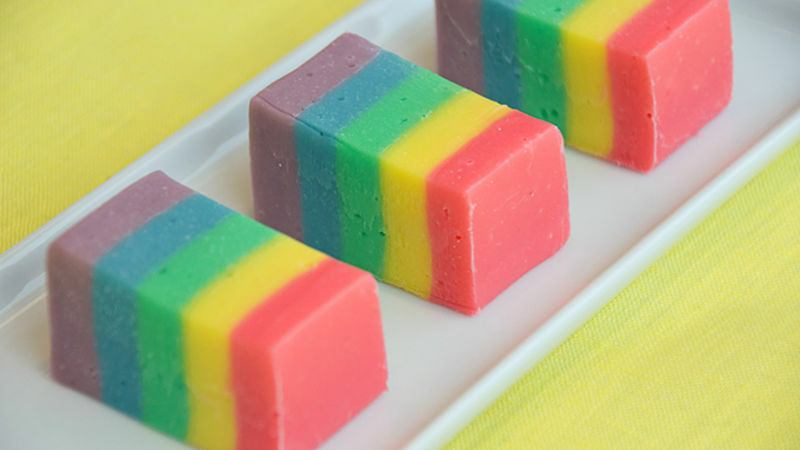 Color your holiday world like never before with this Rainbow Fudge recipe! Fudge is the staple of holiday staples. Dark and rich, it finds its place on cookie plates everywhere this time of year. But wait! This fudge, this brilliantly bright and bold Rainbow Fudge, will not only color your holiday like a crazy case of crayons, it'll rock your Christmas socks and blow the fuse on Rudolph's nose! What a super wonderific choice to take to a holiday party. We even have an easy hack to line a loaf pan with foil the right way! 1. First, turn your loaf pan upside down and press the foil around the upside down pan. 2. 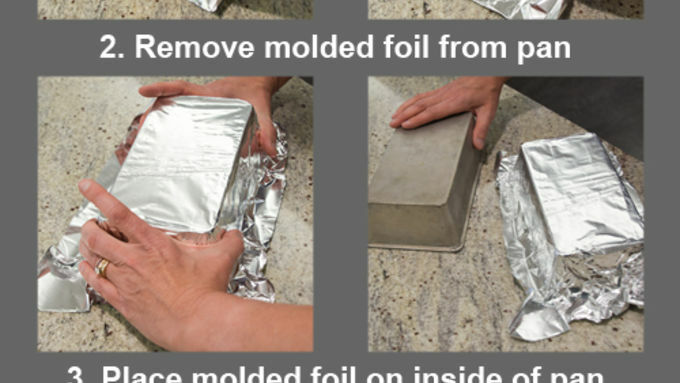 Remove the molded foil from the pan. 3. 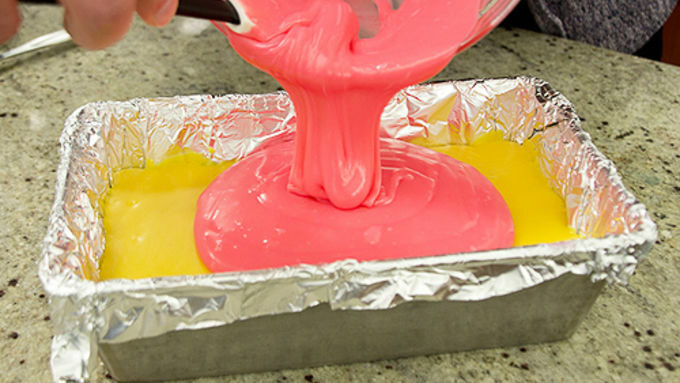 Place the molded foil inside of the pan. Voila! A perfectly lined loaf pan! While white chocolate can be finicky, we found Baker's brand works really well. To remove any bubbles from the fudge, simply tap the pan on the counter to make it burp up the air bubbles. Thwack it nice and flat onto the counter a few times. Air bubbles = holes in the fudge, and we don't want that! Then put it in the FREEZER for 15 minutes or until the top appears set. This step is super important because it keeps the layers separate. 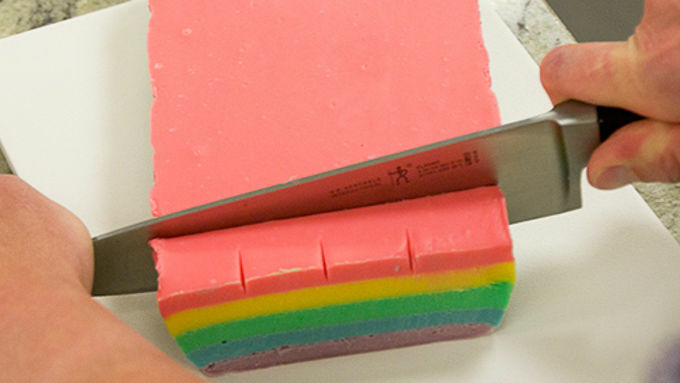 You can cut it into rectangle slices, or you can cut it into any size pieces you want. To make rectangles, mark off about 1" intervals both directions. No need to be perfect. Just eyeball it up or use a ruler if you want. This fudge is softer than typical fudge, so use a sharp knife. If it gets too soft to slice easily, just return it to the fridge to firm up a bit more. Now, there's only one thing left to do -- clean up the prettiest kitchen mess ever.